AIRPURELite is an amazing technological breakthrough! Developed to respond to energy conservation and air purification, it is an energy- efficient light source with a TiO2 (titanium dioxide) coating that effectively kills and destroys mold, fungi, viruses, bacteria, household odors, pet odors, and smoke on contact! This state-of-the-art technology is not only effective and easy to use, but is the most affordable way to enjoy the benefits of TiO2'S (titanium dioxide) photocatalytic action. Bulbs fit most standard lighting fixtures and lamps. Not intended for use with dimmers or enclosed fixtures. Reduces harmful microorganisms from the air. AirPureLite's photocatalytic action reduces harmful microorganisms that are constantly circulating through the air, into harmless CO2 (carbon dioxide, which is expelled during respiration) and H2O (water), completely eliminating microorganisms, making the AIRPURELite completely safe for people and pets. The air in your home may be 100 times more polluted then the air outdoors. Most Americans spend up to 90% of their time indoors. Recent studies have shown that no home is immune to indoor air quality problems. New homes tend to have higher concentrations of chemicals. Older homes are breeding grounds for mold and mildew. And all homes, no matter how clean they appear, are contaminated with airborne bacteria, viruses, fungi and mold. For some people, this may mean no more than irritated eyes and sinus discomfort. For others, particularly children, seniors and those who suffer from allergies or asthma, the effects may be long lasting and devastating, known also to lower one's own energy level and further compromise one's immune system. According to the EPA, the air inside your home may be up to 100 times more polluted than the air outside. Pollutants in the air in your home can cause aggravated allergies, asthma and other health problems. Spray disinfectants that often just mask an odor or poor air quality, can be harmful to humans and household pets, too. AirPureLite doesn't make a sound and has no expensive filters to clean or replace. AIRPURELite functions more effectively than most other air cleaners on the market. It also works without the large, complicated and initially expensive units that other air purifiers require. There are no expensive filters to clean or replace. AIRPURELite does not make a sound, while other air cleaning systems may be so noisy that you may have trouble getting to sleep if you use one in your bedroom. AIRPURELite is available in Standard Incandescent Equivalent 2700K , Full-Spectrum daylight 5500K and also a most convenient 2 watt night lite. With a light output equivalent to that of a standard 100-watt light bulb, the 23-watt AirPureLite 5500K 90 CRI Full-Spectrum bulbs have a LUX value of 10,000 at a distance of 16 inches. 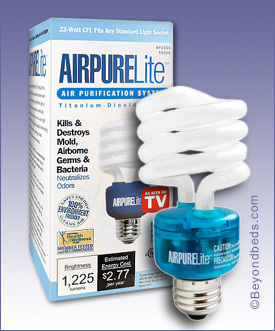 This makes the Full-Spectrum AIRPURELite perfect for use in table lamps, desk lamps and floor reading lamps. The 42-watt AIRPURELite Full-Spectrum, at the traditionally recommended one-foot (approx.) viewing distance, produces about 27,000 LUX, which is perfect for use in ceiling fixtures or with a plug-in wall adapters. (This 42-watt Turbo would be far too intense for close distance lighting such as a table lamp and therefore not recommended.) Light therapy to combat (S.A.D.) Seasonal Affective Disorder has proven effective in over 80% of diagnosed cases with exposure from 30 minutes to several hours per day to very bright light at least 10 times the intensity of ordinary domestic lighting. Children in classrooms with Full-Spectrum lighting have shown improved behavior and attention and greater time on task. AIRPURELite is the answer for lighting needs, energy conservation and improved air quality all in one!! The most effective use of the AIRPURELite is to leave it on 24 hours a day, 7 days a week; however, intermittent usage of the AIRPURELite is also effective. Note: Do not use AIRPURELite with a dimmer switch or in an enclosed fixture. If used in a bedroom, turn it on when you awake and off while you sleep.The AIRPURELite is energy efficient and you are only burning 23 watts, the bulb will provide 6000 + hours of light. Note: Many health insurance companies today will reimburse a portion of, or even all, of the expense of a light therapy device, but a proper diagnosis for seasonal depression or Seasonal Affective Disorder (S.A.D.) must have been made by a qualified health professional. Please contact your individual health insurance company for more information and to find out what is required. Note: The AIRPURELite is so energy efficient that it pays for itself, saving you an average of $50 in energy cost over the life of the bulb (lasts up to 6,000 hours - 8 times longer than an average 100 watt light bulb).